Luke: Slavery was always a good offer...to a master. Luke 4:18 - The Spirit of the Lord is on me... because I have been anointed to preach good news to the poor. He has sent me to proclaim freedom for the prisoners, and recovery of sight for the blind... to release the oppressed. Luke: [My father] used to tell me that... no one can cage a man if he truly wants to be free. 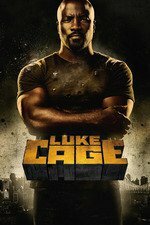 *Luke Cage was originally Carl Lucas, a former-cop sent to Seagate Prison for a crime he didn't commit. *He meets Reva in group therapy. There are rumors of secret experiments, which she promises the prisoners are false. *Prison guard Rackham arranges a cell attack on Luke to test his strength, forces him into gladiatorial matches by threatening his new friend, Squabbles, and later Reva. *Squabbles tries to help Luke with fight training in the yard, but after Squabbles chooses Jet Li over Bruce Lee, Luke says he'll manage his own training. *Reva checks in on Luke, after he has missed months of group therapy due to being in the fights, Rackham realizes he has a new lever to threaten with. *Luke asks Reva about Dr. Burstein, tells her about fight club, warns her to get away from Rackham. *Luke tells Squabbles he's ready to try to shut the fights down. *Comanche and Shades beat Luke nearly to death, in the infirmary Reva tells him Squabbles was killed, tells Burstein to save him. *Burstein puts Luke in the super-science immersion tank, Rackham overloads it trying to kill Luke, but he emerges superpowered, punches through a wall, and utters the first "Sweet Christmas" of the series. *He swims away from Seagate, steals some clothes (in an homage to original comic book costume), and calls Reva. *They meet at a hotel where he shaves, they have their first kiss, and come up with his new alias. *Luke and Connie awake in the rubble. He uses his super strength to dig them out. *Misty and Scarfe review traffic cameras. Cottonmouth's car is somewhat visible, but not incriminatingly enough to tie him personally to the rocket launcher attack. Scarfe calls Cottonmouth's people with the tip-off once Misty gets a call from the fire chief and goes back to the Genghis Connie's rubble. *Luke gets Connie out safely, and when a pack of reporters descend, he faces the cameras and says "My name is Luke Cage." I hadn't actually seen the original Luke Cage comics costume until I looked at the AV Club picture, but I knew that "You look like a damn fool" bit had to be an homage. Cute. A+ banter between Luke and Squabbles, but too bad the show has to kill another mentor figure. As far as origins go, it was pretty OK, but I thought the prison fight ring took up too much time that could otherwise have been spent setting up the creepy prison experiment program. For an episode that spent so much time on Luke's backstory, the actual acquisition of the powers was almost an afterthought. God this episode was interminable and predictable as hell. It has me wondering whether it's worth continuing, since the show's writing so far has been kinda disappointing. I'm not the teen target audience, I know, but I was really hoping for something richer and more fascinating than what these first 4 episodes have delivered. This is the first episode I thought was unnecessary. Attentive viewers had probably already pieced together Luke's origin, so we didn't really need it played out all the way. That said, flashing back to Luke in prison feels thematically important, so I won't begrudge this episode too much... even if I'd probably skip it on a rewatch. The interesting thing is that it's not really an origin story. Luke was cop?! How did he get into prison?! What was Reva's involvement in the experiments? So many questions left to answer? No, I think the prison fight ring actually does a lot to display, justify and explain Luke's philosophies and worldview. It makes it really clear that this sort of violence poisons his soul; that's why it seems to drag, actually, why it's so unpleasant to watch. They rub your nose in it because that's precisely the sort of Fight Club macho BS that a lot of men find exciting and valorizing. And it's a compare/contrast against the vigilante violence Luke was doing last episode. Part of the subtext of the show is a meditation on the just and unjust uses of power. This episode in particular took (what I would call) a feminist slant, valuing and emphasizing the sort of human connections that are discouraged by that macho Fight Club BS. It also explains why Pop's death really hit a nerve for him, makes it more affecting, and it foreshadows another downward spiral for Luke now that he's violence-ing again. This episode was worth it just for the evolution of his prison hair. Okay, so I'm finally spending this weekend getting around to catching up on Luke Cage. I was super bored with the first few episodes. I'm not fascinated by Cottonmouth and his cousin in the way I was Kilgrave or Kingpin, I'm not super into drugs/everyone gets shot plotlines, and Luke's not doing a whole lot besides trying to hide in plain sight. Yawn. But this one I actually found pretty interesting. I always like a backstory explanation, and got his relationship with Reva even if we know that's not going to end well.